This video features the original and official version of The Neverending Story. 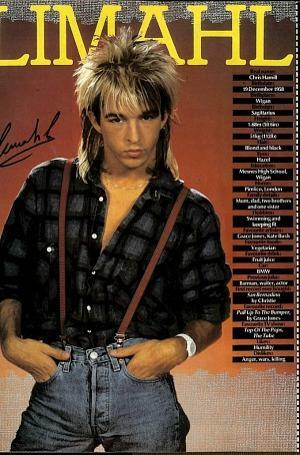 Limahl's first solo hit was in 1983 with Only For Love which reached #16, followed by "Too Much Trouble" which stalled at No.64. However, his third single featured here which gave the singer his biggest and best-known hit which reached #4 in the UK, and also became an American hit, peaking at #17. The song was composed and produced by the electronic music producer Giorgio Moroder, and features one of his legendary arpeggios. The lyrics were penned by Keith Forsey, and the English version of the song features additional vocals by Beth Anderson who recorded her vocals in America without Limahl. 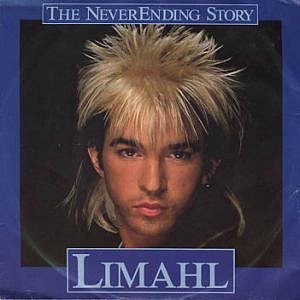 Although the song was included on Limahl's debut solo album Don't Suppose, the album was not particularly successful, stalling at #63 in the UK charts. Follow-up singles also failed to break into the British Top 40. The British singer's biggest success was, of course, with the band Kajagoogoo who had a string of hits during 1983, the biggest being Too Shy, which topped the UK charts and was a top five hit in numerous European countries and also in the U.S. So, who watched Limahl surviving a night in a rat and bug infested room in the Australian jungle? He was accompanied by the jovial chef, Rosemary Shrager, during the 2012 series of I'm A Celebrity get Me Out Of Here.